By voting for a new memorandum, the government and the majority of Syriza’s parliamentary caucus have not just said farewell to left politics but to politics altogether. By making this choice, they have not only disposed of Syriza’s program, or the commitments the government made to the Greek people. They have trampled on the “no” vote of the Greek people, who just two weeks ago strongly rejected the Juncker austerity package, which was a much milder version of austerity than the one imposed by the shameful agreement of July 12. They have additionally ignored the opposition of the majority of their own party’s central committee, the only collective body elected by the party congress and accountable to its members’ collective will. However, there’s something more than the aforementioned aspects and that at the same time transcends them: in going down this road, the government and its parliamentary majority have negated the very idea of politics, which is based on the idea of taking the responsibility of a choice, i.e. sticking by a political decision. Nevertheless, in politics and in social activity in general, it is not inner dilemmas and intentions (noble and otherwise), eventual guilt, and latent thoughts that matter, but actual deeds and their content. It is not by accident that the words “memorandum” or “agreement” are absent from the Tsipras’s statement. The purpose of this media spin is not to defend a political decision, but to trigger an emotional identification with a leader enduring hard trials. But this is also a means to the essential end, which is the stigmatization of party “rebels” as people undermining “the country’s first government of the Left.” Again, political essence, namely the disagreement with a choice, is obscured. It not about submitting to or rejecting austerity, remaining faithful or not to the popular mandate of January 25 and July 5, or upholding or violating the program and the commitments of the government and of Syriza — it is simply about the decision whether to provide emotional support to the leader. This abolition of the very substance of political discourse is a confession of profound weakness. The legitimacy of this third bailout agreement — that is, to another draconian austerity package — isn’t only far weaker than the previous two. It is simply nonexistent. Unlike in 2010 and 2012, in 2015 the ruling political force’s only raison d’être and justification for being in office is the overthrow of those policies to which it has now subjected itself. Therefore, the only real threat for “the country’s first government of the Left” — and for Syriza as such — is not some “enemy from within” but the the suicidal submission to austerity and the perpetuation troika rule. The recent Greek experience shows that the neoliberal shock therapy that comes with the “bailout agreements” doesn’t merely devour governments and prime ministers but the parties that enforce it. The reshuffling of the government, with the removal of all four Left Platform ministries, and the resignation of two other members of the cabinet, provides a good illustration of the rift that has now opened inside Syriza. The mainstream media, which have now become the main channel through which the spin of the government is communicated to the public, openly talk of a forthcoming “purge.” Its first victim might well be the charismatic president of the parliament, Zoe Kostantopoulou, who voted “no” on the agreement and openly supports unilateral default on the debt and a total break with troika rule. Meanwhile, Tsipras, who is also president of Syriza, still refuses to convene the central committee of the party, even though a majority of its members have requested it in a joint statement that also rejects the agreement. The violation of the most elementary rules of party functioning is certainly a very worrying sign of what is to come. 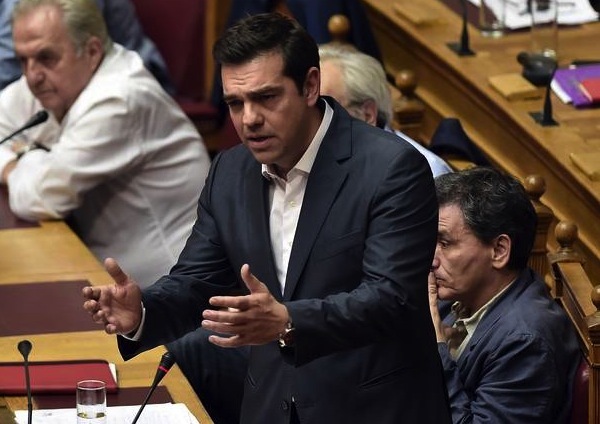 Syriza is now at the crossroads, and its future will be decided in the next few weeks.